How you spend your marketing budget can make or break a young company. There are lots of choices. We have compiled the best advertising methods for lawn care companies to make this choice a little easier. 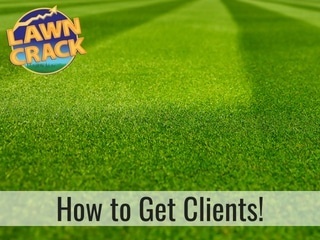 You have all kinds of options to consider on how to market you lawn care and landscaping company. Your budget will play a large role in this, but there are many other factors to consider. Our other company, Optimized, is getting our clients results with our SEO and website design/re-design services. We would love to simply talk to you about your business goals and see if we can help you reach them faster. We want to see more people succeed, especially small business owners. We can help. Do not hesitate to reach out. We will provide a free consultation and quick review of how you look online and let you know if we can help and what the cost would be. No pressure, no obligation. I will go more in-depth on the free, low cost, and medium cost advertising ideas in just a second. But first, a very important thing to consider when deciding which type of advertising to do is your ideal client. You want to make sure your ads are very appealing the demographic you are trying to reach. Is your customer base older? They probably want a more traditional advertisement that drives home your reliability and trustworthiness. Does your ideal client have multiple school-age children? Deliver a message that your company can take the worry of lawn care off their mind and allow them to spend more time with their kids when they are not working. Also, always be sure the people who see your ads are located within your service area. The tighter you can make your routes, the more profitable your company will be. I have experience with all of the types of advertising listed above with the exception of TV and Radio ads for this reason. Everyone always says word of mouth is the best advertising. They are probably right, assuming you are doing quality work and the people are saying good things about you! Never forget that word of mouth is much more effective when someone is bad mouthing your company. Do quality work every service and you don’t have to worry about that. Word of mouth really boils down to referrals, but I also wanted to include referrals as a stand-alone item. If you network with other local business owners, in your industry and outside, you will begin to get a flow of customers from these sources assuming you do quality work and they like you and trust you. Craigslist is a free option. I don’t highly recommend it by any means as you never know what you are going to get on Craigslist. In my experience, most people that try to find a lawn service on Craigslist want a lot done for very little. Just be careful if you choose to do this. It should make your phone ring, but the customer you attract may not exactly be what you are looking for. I have only advertised in the services offered section personally with a little success when I was getting my business started several years ago. Recently, I have heard people having some success posting in the yard sale section of Craigslist for their lawn care services. Most definitely you can pick up customers by going door to door. Are you willing to do it though? No doubt, you will be told no a lot. Get used to it…you are running a business. If you really need customers, go out there, knock on the door, introduce yourself quickly, and tell them you would love to earn their business. This will be more effective in the spring, but people decide to finally start using a service all throughout the year. Or maybe, you knock right at the right time after their current provider has just messed something up. Wrapping up the free marketing tips is Facebook. Simply make a business page for your business and start posting. Invite your friends and customers to like your page. Make it part of your schedule to take a picture of a lawn you are working on roughly 3 days out of every week and write a short note to go with it. You have to do this consistently for a period of time before you can expect this to start bringing you much business. You have heard the saying, “You have to spend money to make money.” Well, it’s true, and most people aren’t willing to spend a little bit of money to even have a chance to make the big bucks. Business cards are essential to looking professional. They are super cheap, so get some! Please just make sure the design is decent and use a thicker stock paper as the medium. A plain Jane, flimsy business card is not going to impress anybody or make them want to do business with you. Your website will hands down be how you get most of your customers if you do it right. I recommend using WordPress to build your site. You can learn how to make a WordPress site by watching a couple hours of tutorials on YouTube and make it free, minus the cost of your domain and hosting. If you need help with your website, please feel free to reach out to Optimized. Having a good-looking, functional website is only half the battle. You will need to optimize your site so it will show up in the search results. The is referred to as SEO, or search engine optimization. If you are not familiar with SEO, you can learn this too on YouTube, or again, feel free to contact Optimized. Uniforms and truck graphics are a must if you are wanting to display that ‘real’ business look to the world. I don’t think these are needed as you are just getting started and cash flow is tight. As soon as it financially makes sense, it is time to do this. Think of any successful business, with the exception of some techy start-up types, that doesn’t have uniforms or a dress code for their employees. You can’t. Uniforms won’t bring you much business if any, but the graphics on your truck will. Make sure your graphics include your logo, name of your company (If not in your logo), phone number, and website at the bare minimum. Bandit signs are the same as those political signs you see everytime election time rolls around. 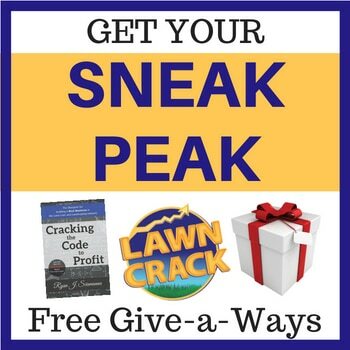 These are one of the best forms of advertising a lawn care or landscaping company can do. You can advertise for seasonal services on these signs to fill out your schedule on those services, but what I like most about this is how they allow you to target certain customers with your ad. Put the signs at the entrance and exit to a neighborhood you are wanting to grow your customer base in. Is it a big neighborhood? Make the sign custom for that neighborhood and tell them residents get special pricing (Always make sure the price you end up charging makes sense for your company. I offer discounts, but always inflate the quoted price before applying the discount.). You can also target a broader area by placing these at the end of interstate off ramps. Check your local laws, but the worst thing that has happened to me by setting these signs out is that people throw away my signs. Oh well. If you want, you can place them out for 2-3 days and then come back by to pick them up. You may lose a couple still, but these signs can certainly be reused. Running ads on Google and Facebook should really be left to an expert. You can learn how to do either of these on YouTube, but if you do them incorrectly, you can lose a lot of money very fast. Especially on Facebook, you can really target your ads to the people you want to see them. This is why these internet ads can be so effective. Door hangers are great because you can put them on the doors of the neighbor’s of the houses you are already working on. Make this piece stand out and offer an incentive if you can to get them onboard. Your cost to service this property should be somewhat low anyways since you are already next door! Honestly, the only more expensive advertising method that paid off for my company was an EDDM campaign. This is an Every Door Direct Mail campaign offered by the USPS. I made a YouTube video on this, and a couple on my website because they provided the greatest return for me. My advice on running an EDDM campaign is to make sure you at least mail to the same houses twice, if not three times. You will get an exponentially better response rate by doing so. I do recommend having 2 or 3 different postcards made, but you could potentially send the same card if needed. Timing is critical with this. The very best time to run this ad is right before spring comes. One thing to watch out for is apartment and condo associations on the mail route. If you were to send your mail pieces to one of these, you would definitely be wasting a lot of money. You can see every street that each mail route will hit before you select it. BNI is Business Networking International. This is a paid membership group of professionals who network together to pass business back and forth. There is a monetary cost to joining to the tune of $500 per year, but the real cost is in the time it takes to make the meetings each week. If you cannot make a couple meetings or get a sub to fill in for you, BNI will kick you out of the group and keep your money. I recommend trying to find a free networking group before joining a BNI. You may find a great free group and not need BNI. I must say, as much as I really do not like BNI, it did really give my business a boost as I went from a solo operator to hiring my first crew members. Postcards are what you would be sending on an EDDM campaign, but here I am referring to targeting very specific locations with a postcard. Maybe the surrounding 5 houses to all of your customers. There is software that can help you automate this process, but this is a great way to tighten up your route. If only done on a small scale, this would actually be a low budget advertising method. Sponsoring a local attraction was hands down the worst ROI I ever got personally on any advertisement I have ever done. I say that only to caution yourself. Make sure you honestly estimate how much business you will get by doing something like this. My specific example was sponsoring the local minor league professional baseball team. So many local businesses advertise here, I think my little ads simply got overlooked by everyone who attended the games all season long. Since I ask every customer how they heard about us, to optimize my future advertising efforts, I believe I only got one customer from this ad. It cost me $3300 to advertise with them for the season, and I got 1 $1300 job from it. Be warned!!! The more you can target your ads the better you will be. If you know a demographic you are going after, tailor your ad to appeal to them. Always ask your customers how they heard about you. You will want to drop off any advertising methods that are not working and focus on the ones that are as you grow your business.